As the name suggests, it is a sporty kick scooter especially to rougher terrain or long downhills. The scooter is equipped with hydraulic disc brakes and a lockable suspension fork ZOOM. Front 26" and rear 20" wheels are equipped with Czech made tires Mitas. The braking system consists of hydraulic brakes TEKTRO that does not lose braking effect even during long, hard braking. 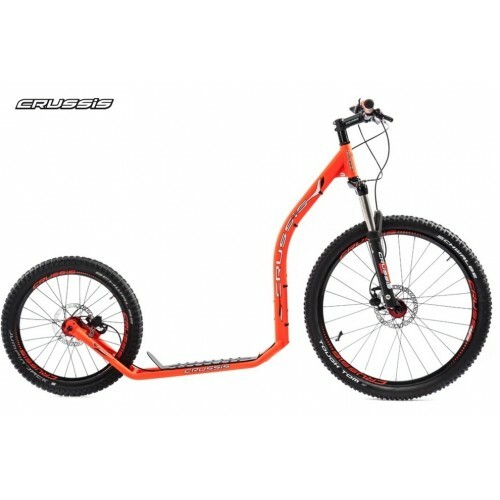 ZOOM suspension fork ensures maximum ride comfort even on rough terrain. In order not to lose energy when rebound front fork is equipped with a lock. It is possible to lock or unlock the fork at any given time depending on the rider’s need. Frame structure is reinforced in the most stressed parts of the kick scooter. The frame is rigid, driving properties are accurate and scooter perfectly transmits power of rebound. Handlebars and stem carry CRUSSIS logo. The scooter is designed as for children from 8 years old as for adults up to 6ft 7in. CROSS kick scooters category are designed primarily to terrain or long downhills. Enjoy your ride!